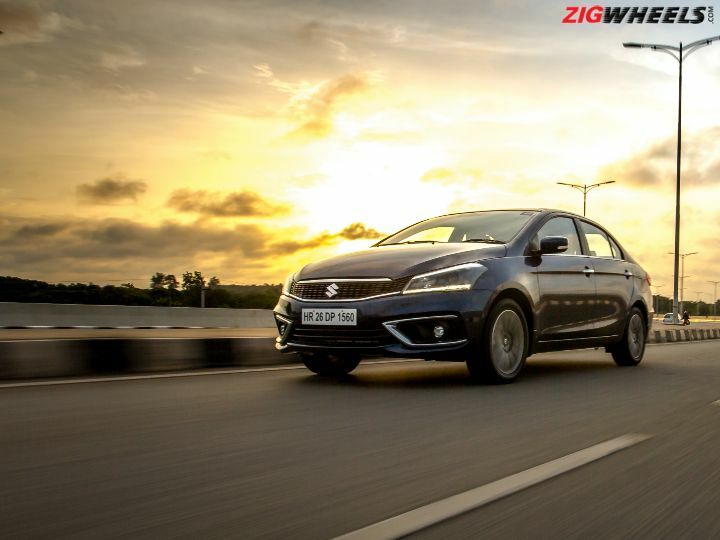 Does the 2018 Ciaz give you new reasons to consider buying one? What's always more difficult than getting to the top is staying there. Take the Ciaz for example. Maruti Suzuki got third time lucky because, in India's second most sought after sedan segment, the Ciaz was their first winner. But since it was launched, we've seen new arrivals like the Yaris, rebirths like the Verna and revisions like the City facelift, all of which have brought something new to the table. Simply put, the competition wasn't making life easy, so the Ciaz had to keep up. And it has, with the 2018 facelift. So are these just a few token tweaks or do we have new reasons to buy the Ciaz? Facelifts are often either too subtle to differentiate or so over the top that you have to ask, “Oh God, why?” But with the new Ciaz, Maruti's struck a good balance. It's sharper, more distinctive and while you can tell it's the Ciaz, enough heads will turn to assure you that you're driving something new. While the Alivio facelift (Alivio = Ciaz in China) took a leaf out of Lexus’ handbook and got a grille big enough to have its own pin code, the new Ciaz does the opposite. Its face sports a sleeker grille that drops the old quad-chrome slats for two slim chrome accents. Even the fog lamps get new and more aggressively styled enclosures. All of this comes together to make the Ciaz look less business-like and sportier. It bedazzles too with not just LED projector headlights and DRLs but also, LED fog lights. Neat! The side profile remains largely identical, save for the new wheel designs. With no change in dimensions, the Ciaz is still the longest car in its segment, so the badi gaadi look stays uncorrupted. It's at the rear that you get a throwback to the original Ciaz concept car. The revised tail light clusters now sport LED stripes, adding a dash of flash to an otherwise simple looking rear. There's even some chrome around the rear reflectors which should tickle the Indian taste just right. While the exterior is snazzier and new, the interior hasn't really changed. It's still the only car in the segment with enough cabin space to make the Honda City nervous and a big 510-litre boot to match. Also, while the interior is more functional than funky, it's classy nonetheless. However, look closer and you spot a few experience enhancers. Rear seat owners, a big demographic for the Ciaz, will be happy to note that the sedan now gets adjustable rear headrests. Apart from the new faux wood, you also notice that the right side stalk of the steering wheel isn't blank anymore. That’s because the Ciaz now gets cruise control. Also, petrol Ciaz buyers get a cool new instrument cluster, complete with a 4.2-inch TFT colour MID. Apart from the usual trip info, range and average fuel efficiency readouts, it now features some cool displays too. There's the power/torque graphical display we've seen in the Baleno, a graph showing your acceleration and braking patterns and another that shows the SHVS system in action like we've seen in proper hybrids like the Camry and Accord. Why is this MID exclusive to the petrol Ciaz? Well, because the SHVS here is a first since this new system adds a lithium-ion battery to the equation. It's also why the 2018 Ciaz petrol got so much more expensive. The lithium-ion battery is an import, at least until the Suzuki-Toshiba battery factory in Gujarat is operational. This battery enables better energy storage during brake energy regeneration and more torque assist during acceleration. And that's not all that's new in the petrol Ciaz. New look and added features aside, a big new addition is the K15B 1.5-litre petrol engine that makes 105PS and 138Nm of torque. This more powerful yet more efficient motor should be cause for celebration. But let's get one thing straight. The old 1.4 isn't a bad engine by any measure. Bland, sure, but very usable. So we're checking if the old positives have been retained (or improved upon) while hoping for some gaps to be sealed. First, the good news. Even with the new, more powerful engine, the Ciaz is as easy to drive in the city as ever. The low-end torque is strong and you can comfortably manage daily commutes without having to cross 2000rpm. The initial gearing is on the taller side too, so you don't have to work the gearbox too much to have enough grunt to keep chugging along. Also, since the output gains (12.5PS and 8Nm) aren't biblical, accelerating hard is still a pretty drama-free affair. Performance gains are smooth, gradual and predictable, not spiky. This motor is also in its element while cruising. Set the newly added cruise control anywhere between 80-100kmph and it's calming to drive, ticking over at 2000-2300rpm. But while the old traits have been retained, the mid-range performance still isn't where you'd want it to be for a premium sedan. For instance, say you're cruising in the rightmost lane at about 80kmph in 5th. If the car ahead of you slows down and forces you to tap the brakes, you will have to shift down to 4th to keep pace or face the angry dippers and honks of traffic behind you. So high speed overtakes warrant quite a bit of planning, a downshift and revving the engine beyond 3000rpm, especially if you've got passengers on board. Is the new engine better? Sure, but the gains are minor so we can't call this a tangible improvement. However, there's a fine distinction to make here. The Ciaz isn't underpowered. It just lacks the enthusiasm and highway effortlessness you'd expect from a car in this segment. The outside is wow but at its heart, the Ciaz petrol just wants to be a hassle-free commuter and we honestly don't see that being a problem for most, especially when the claimed fuel efficiency is better than before. It's a similar story with the Ciaz petrol AT as well. It too gets the new engine but the same 4-speed AT as before. It now gets ESP as standard too. This transmission, too, is best suited for commuting. Although the gear changes are smooth, they are noticeable and not lighting quick. The best way to use it is with light throttle inputs and an understanding that this is no enthusiast-pleaser. With part-throttle inputs, the Ciaz auto hits 40-50kmph quickly and upshifts around 2000rpm, which is the engine’s sweet spot. Go hard on the throttle and the kickdown is accompanied with a little jerk. Sadly, there aren't any paddle shifters. Maruti should have at least equipped it with a manual mode, which would've been handy on the highway in particular. Like in the manual, you will find yourself downshifting for overtakes at high speeds. Overall, there isn't much to be said about this automatic transmission. It'll get the job done but isn't as competent as its CVT, DSG or torque converter-equipped rivals. Maruti has also integrated some small but significant features to make the Ciaz a better package. Rear parking sensors, for example, now come as standard as does speed alert (single ding at 80kmph, continuous beeping at 120kmph and above) and seatbelt reminders for both front occupants. Those LED projector headlights aren't just nicer to look at but also get automatic activation and auto levelling. Even the instrument cluster gets a “Halo" that changes colour based on the drive mode (White = SHVS active. Green = Eco drive mode. Blue = Other driving conditions). The 2018 Ciaz facelift is an intelligent one. It wraps the Ciaz’ simple but proven package in a more emotive deal. What was once deemed a safe and predictable choice is now a car with some personality and one that makes a statement. Yes, they could've offered a variant with six airbags, a more pleasing petrol engine, an automatic transmission that's more 2018 and maybe even a sunroof. But at its price, the Ciaz does undercut the competition while still giving you new reasons to consider buying one. I purchased a Ciaz Alpa automatic petrol car recently, only I getting 12km/l. Why any reason. I purchased a Ciaz Alpa automatic petrol car recently, only I getting 12km/l. Why any reason. What is the on road practical mileage of Ciaz facelift petrol 1.5 in both Cases of AMT and MT? City vs Highway. What is the on road practical mileage of Ciaz facelift petrol 1.5 in both Cases of AMT and MT? City vs Highway.